CRADLED securely in its mother’s arms, Taronga Zoo’s newborn gorilla made its media debut this morning. The tiny female Western Lowland gorilla was born 10 days ago, on January 15, to mother Kriba and father Kibabu. It was named Kipenzi, which means ``precious one’’ in Swahili. Impressive silverback Kibabu, who weights more than 200kg, kept a watchful eye on mum and bub as they ventured out before a group of photographers to have breakfast. Kriba held Kipenzi in a fast grip, sometimes letting go for a few seconds to scoop up some celery and carrots, with Kipenzi clinging tightly to her skin. Kriba often wrapped the infant in both its arms, shielding the infant away from the other gorillas. 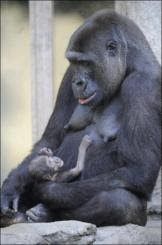 ``She won’t let the others touch the baby yet, they can just watch,’’ primate keeper Lisa Ridley said. ``In the first few hours after the baby was born, Kibabu walked past, put his hand on the baby’s head, and walked off. It was a very touching moment. Kipenzi is Kriba’s fifth baby, and the eight born since the group arrived at the zoo from Holland in 1996. Kipenzi’s sister Kimya had been especially interested in the newborn. ``She stays close to mum and baby, watching their every move,’’ Ms Ridley said.